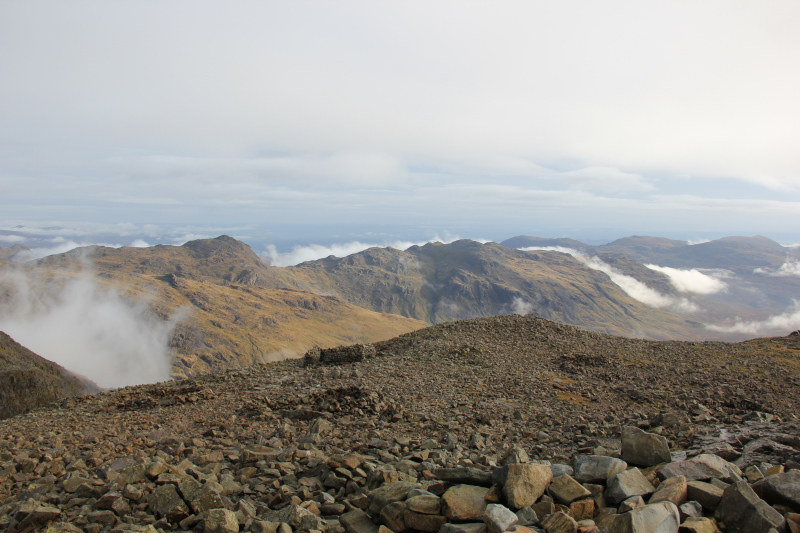 Following two foul weather days, and with another foul weather day forecast for tomorrow, I decided to make the best of today by undertaking an ascent of England’s highest, Scafell Pike. 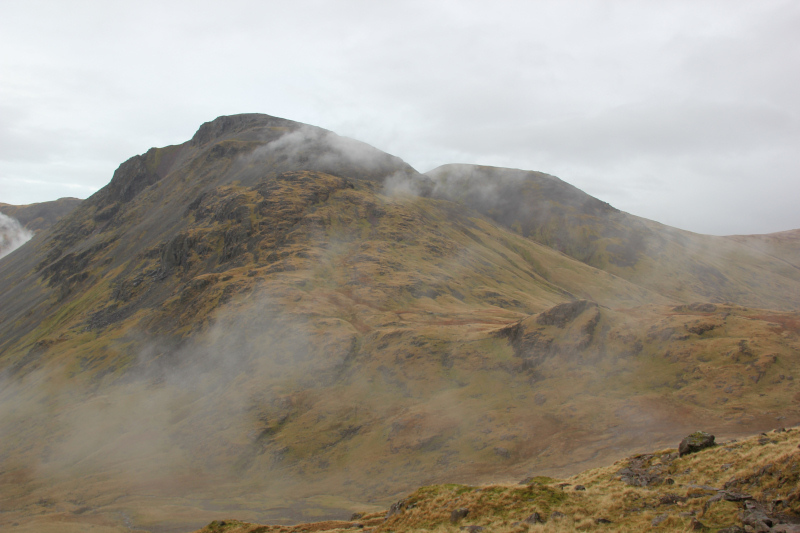 The MetOffice forecast today for Scafell Pike was “FOG” all day, so my expectations were not high. 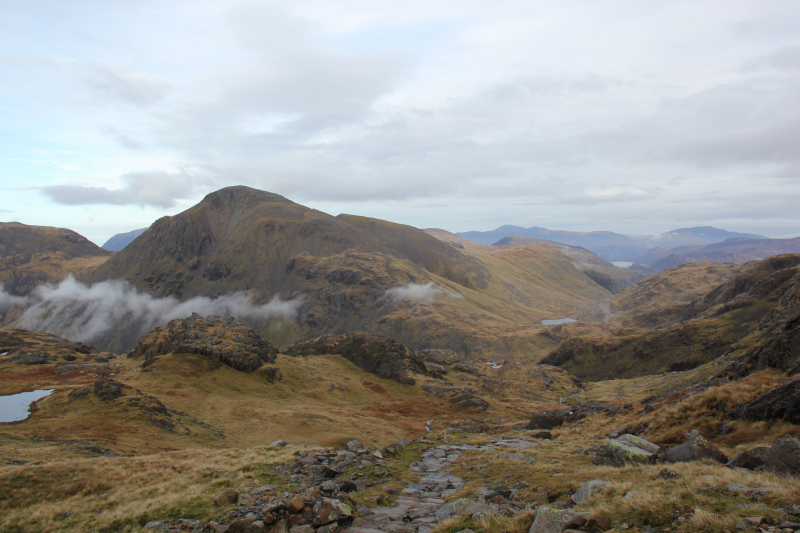 I opted to ascend Scafell Pike from Seathwaite via a route called ‘Corridor Route’. 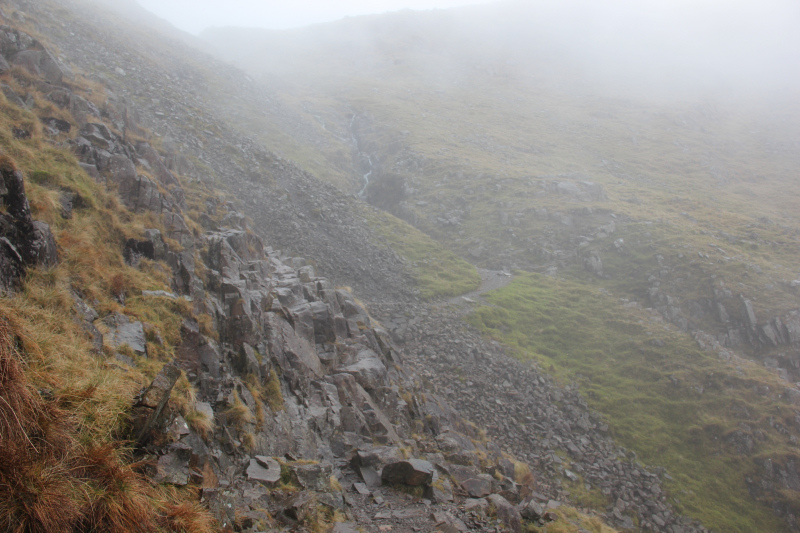 This route involves a few small sections of Grade 1 scrambling. 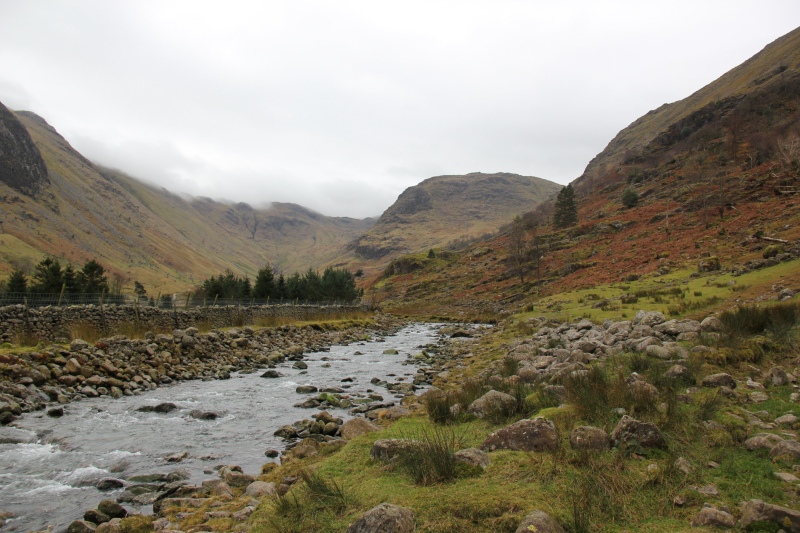 I drove to, and parked at Seathwaite, where there is free parking. 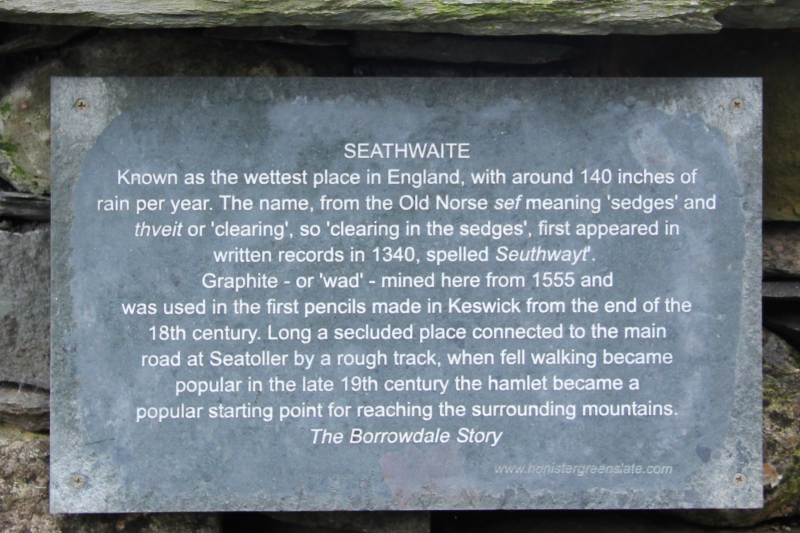 Given the two previous days of torrential rain, it was not reassuring to find a sign at the start of the walk advising that Seathwaite is the wettest place in England. I hoped that today’s weather would not be contributing towards the 140 inches of rain per year. 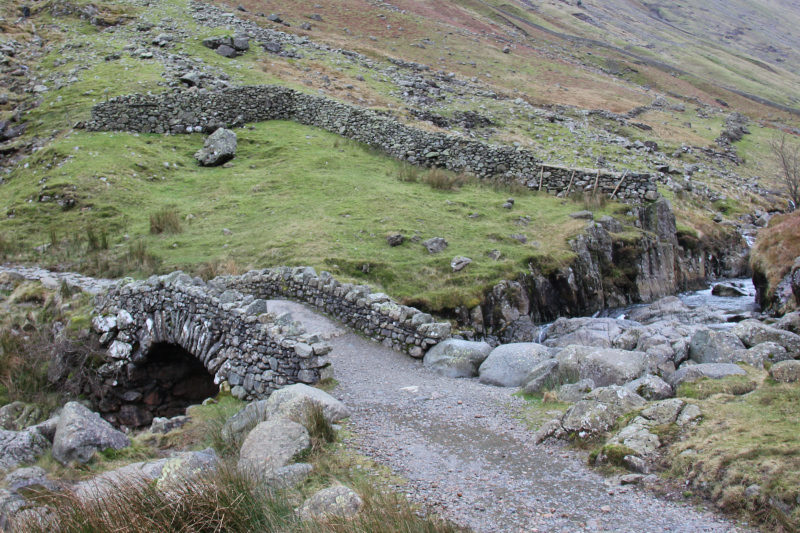 On entering Seathwaite farm, I made a bad route choice. I decided to cross Grains Gill to take the path towards Taylorgill Force instead of using the excellent main track on the other side of the Gill. 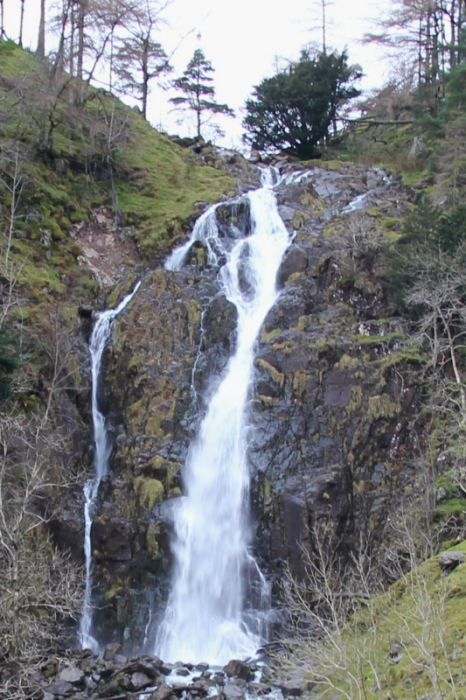 On reaching Taylorgill force, which is a nice waterfall, I scrambled up towards a small wall and gate. After going through the gate, I had my doubts as to whether or not I was actually on the path or at a waterfall viewpoint. I didn’t like the look of what lay ahead. 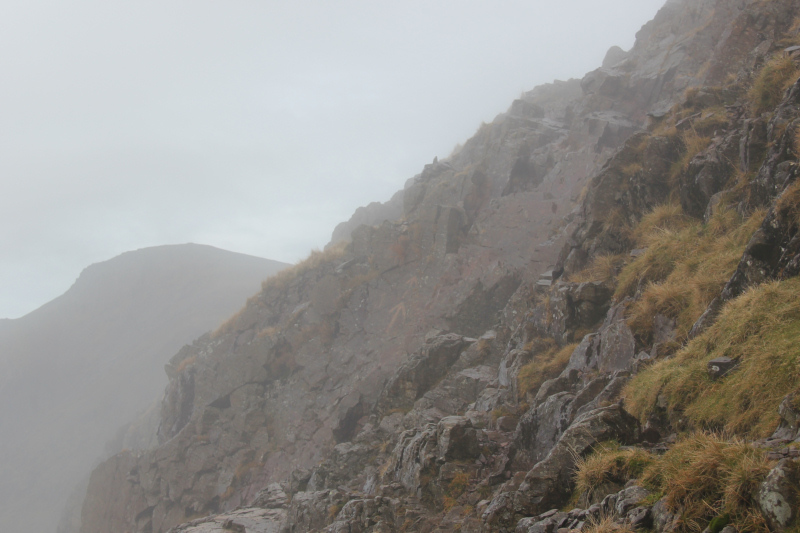 A good rule when you don’t know the route/terrain is, ‘Don’t climb up anything you might not be able to climb back down.’ The wetness of the rock was the deciding factor. I would descend back down towards the main track. 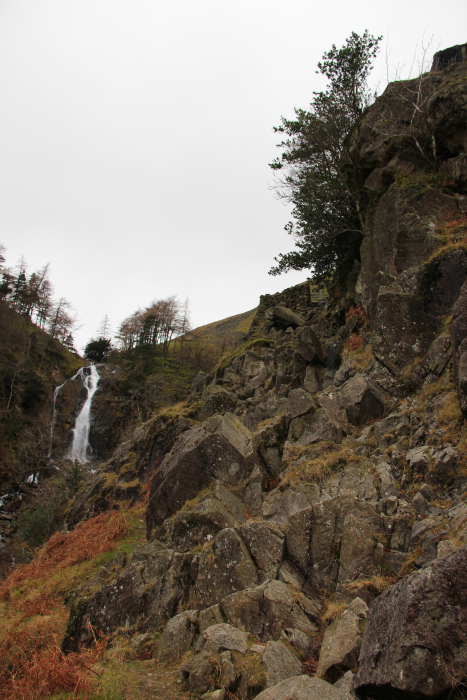 The downside to this plan was that I would have to cross Styhead Gill at the point where it met Grains Gill. Despite the Gill being in spate, I found my way across with dry feet. 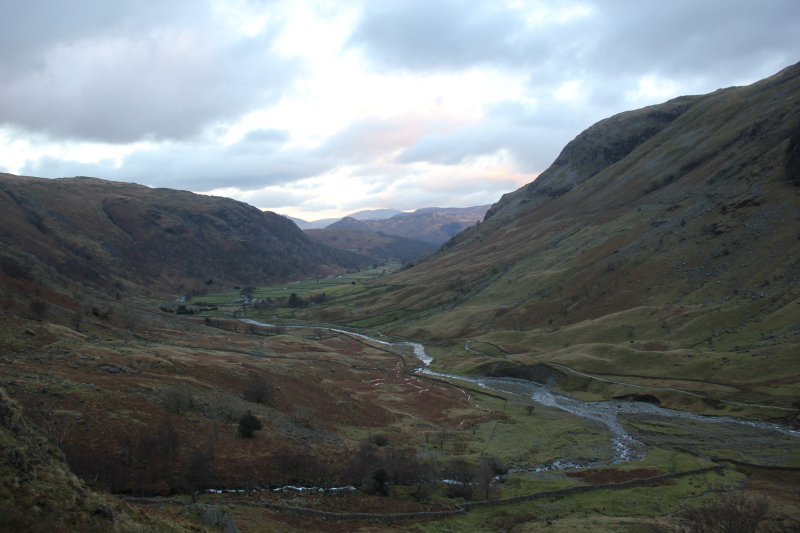 From Stockley bridge towards Styhead Gill, I followed an excellent track. Ascending the track felt almost like walking up stairs. 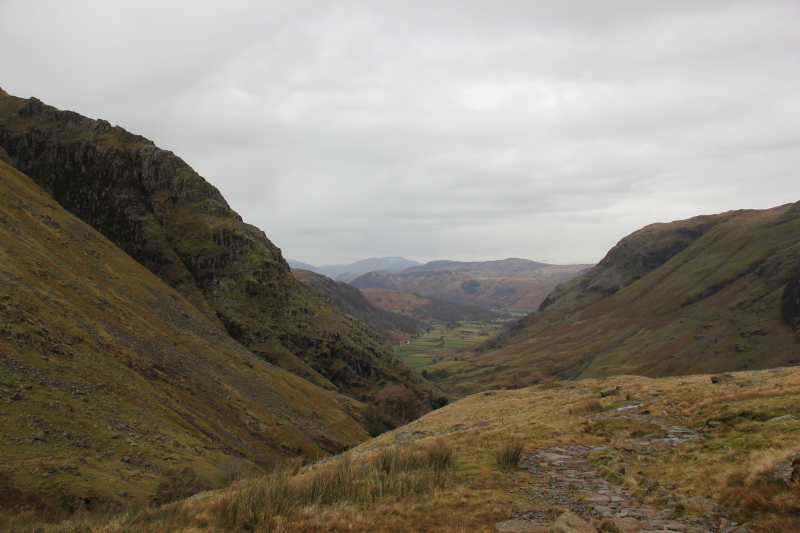 After the steep pull up on the good track, I made my way along the Styhead Gill path. There are several very large cairns marking the track. 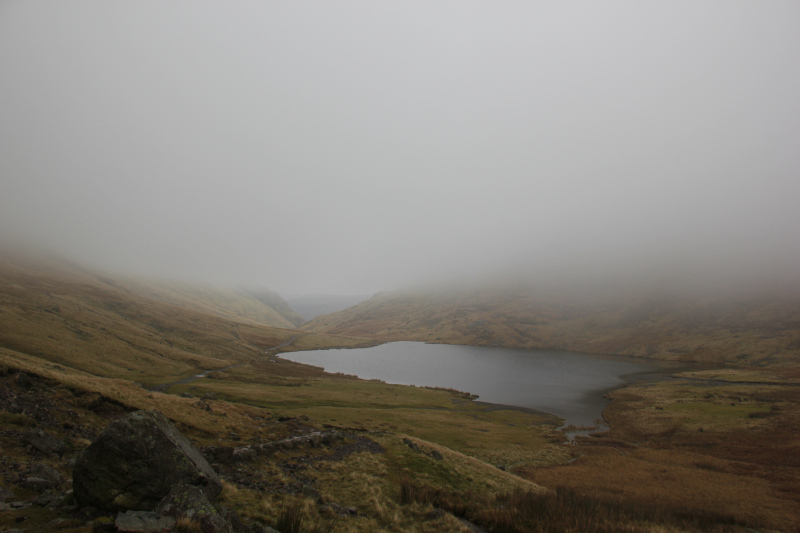 I was a bit down-hearted at this point as I could see that I would be ascending into the cloud or “FOG”, as the MetOffice had predicted. 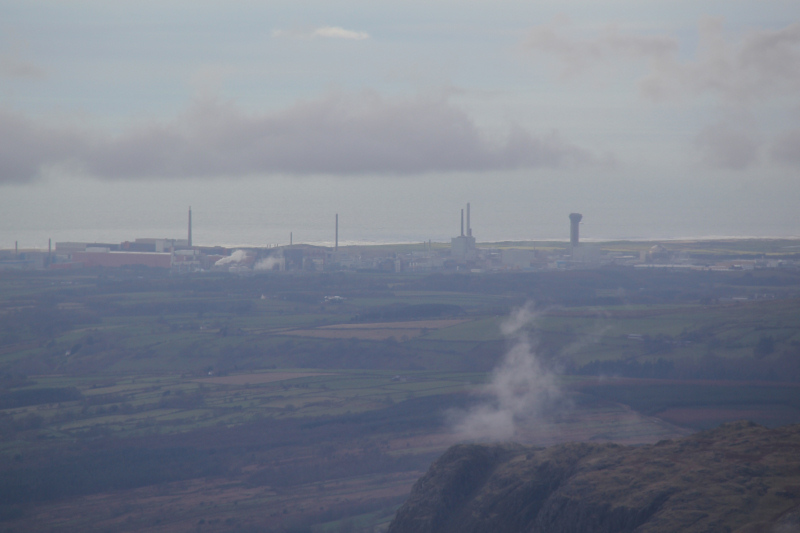 Another concern was route-finding in the cloud, in an area I had not walked previously. 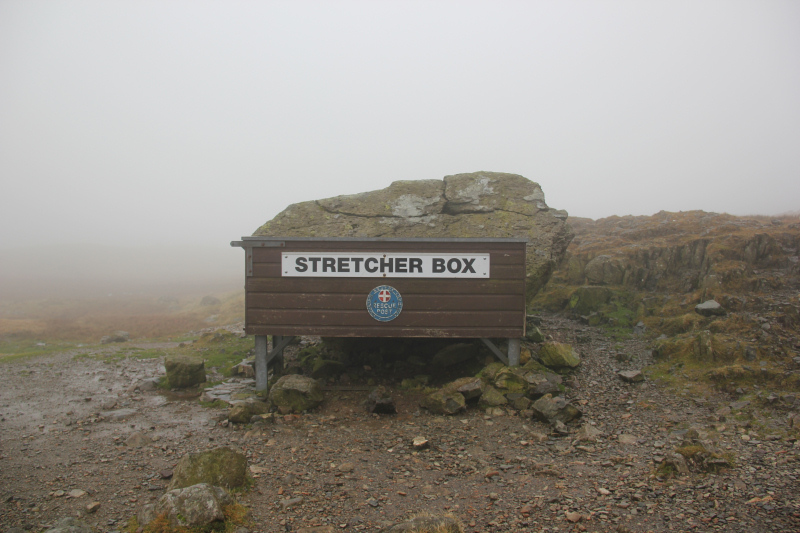 On reaching the Mountain Rescue stretcher box at Sty Head, I used Viewranger on my phone to ensure that I was on the correct track heading towards Corridor Route. 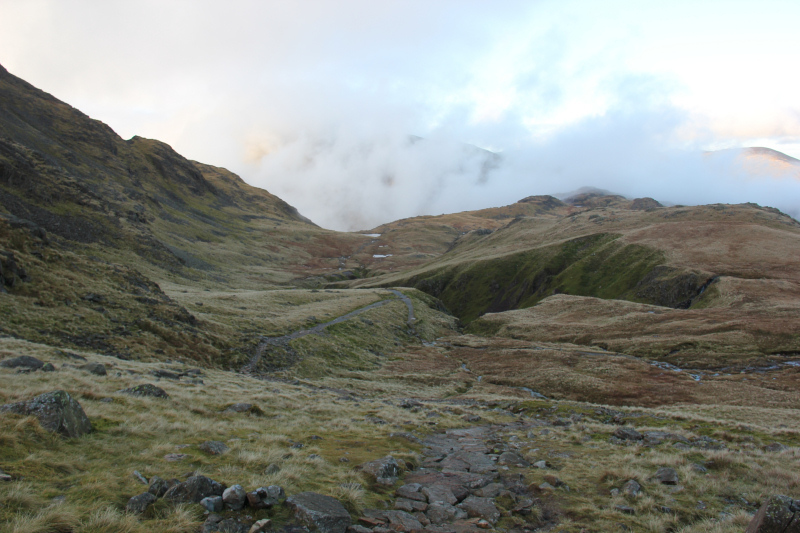 There seems to be a multitude of tracks in the Lakes, not always going where you want! 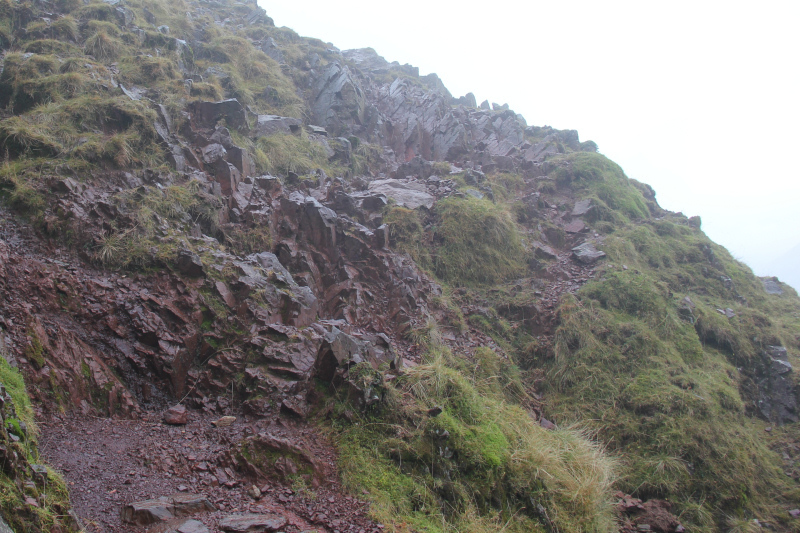 There were only a handful of scrambling sections on Corridor Route, photos of which can be found below. 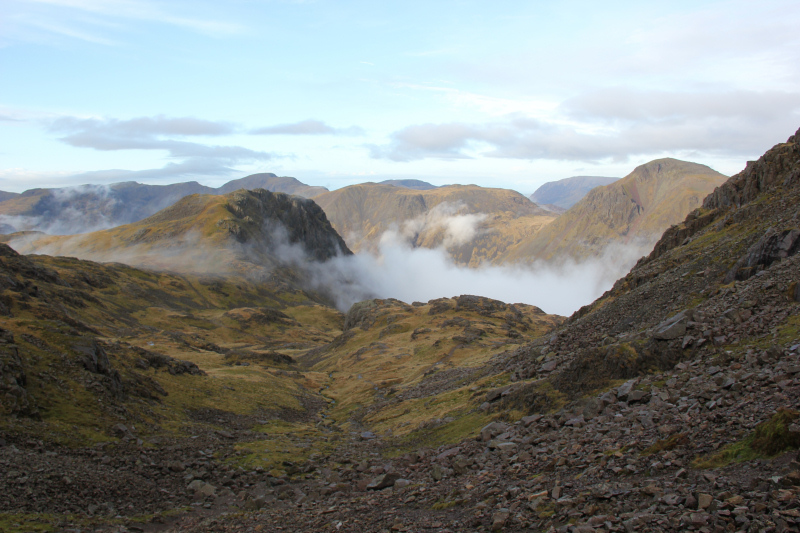 As I progressed along the Corridor, I could hardly believe it when the cloud started to lift and dissipate. Superb . 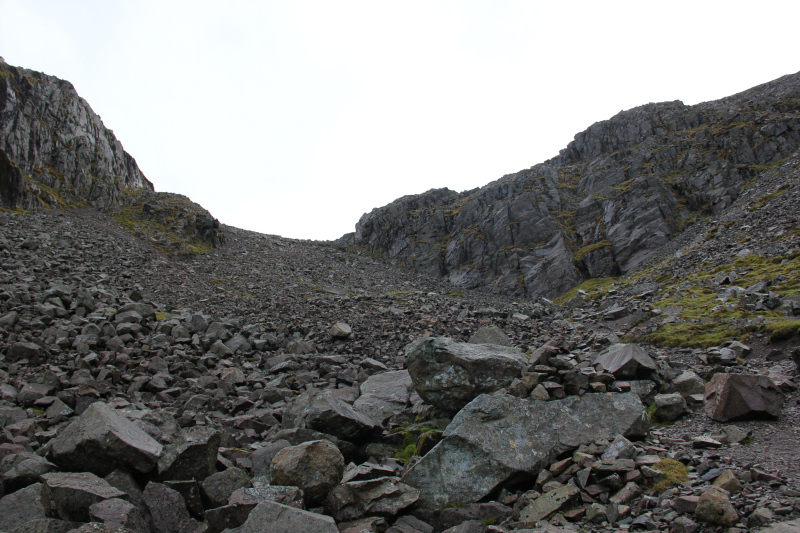 The scrambling section in the next photo was the trickiest bit of the route. If doing the route in reverse, there are arrows pointing you the correct way. 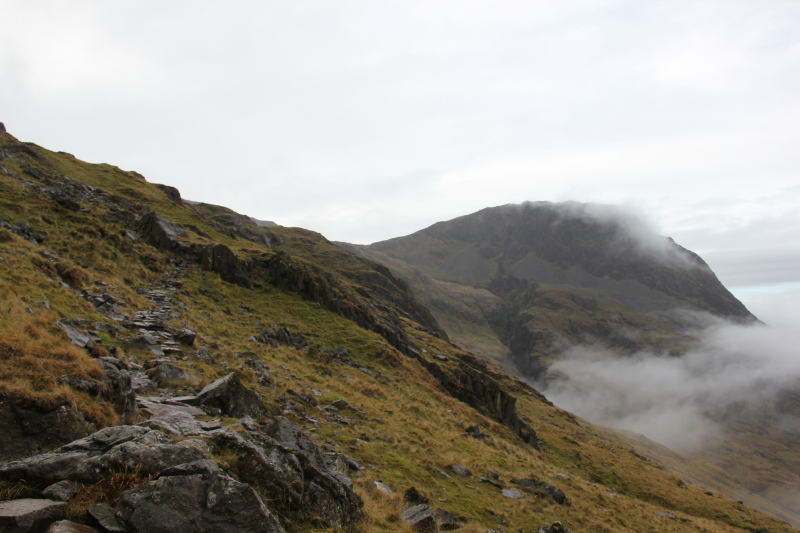 Beyond the next easy scramble, the remainder of Corridor Route was a walk. 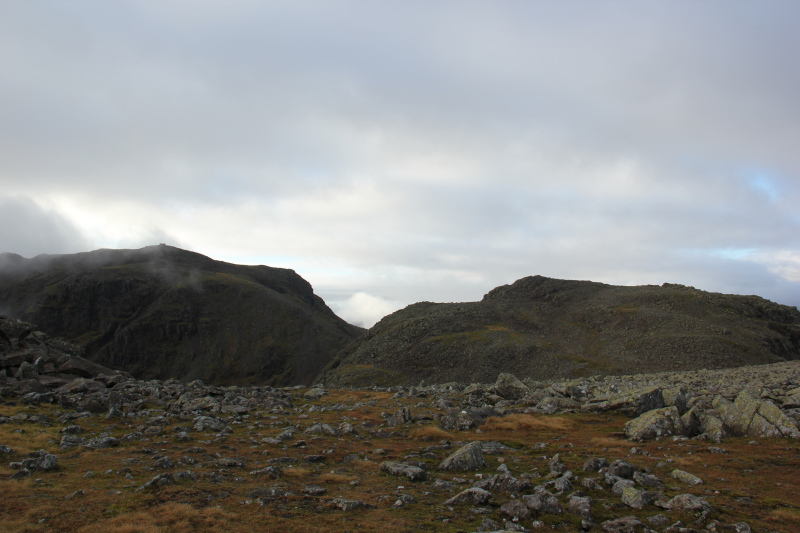 As I continued towards Scafell Pike, I came to a track junction that was not marked on my map. There was an additional well-constructed path there, so I decided to take it. 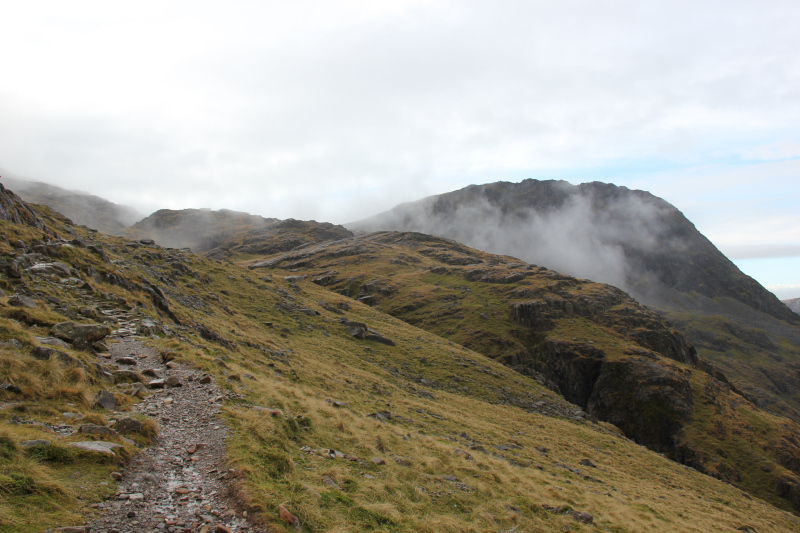 The track, not marked on the map, led to a couple of scree slopes leading onto the ridge. 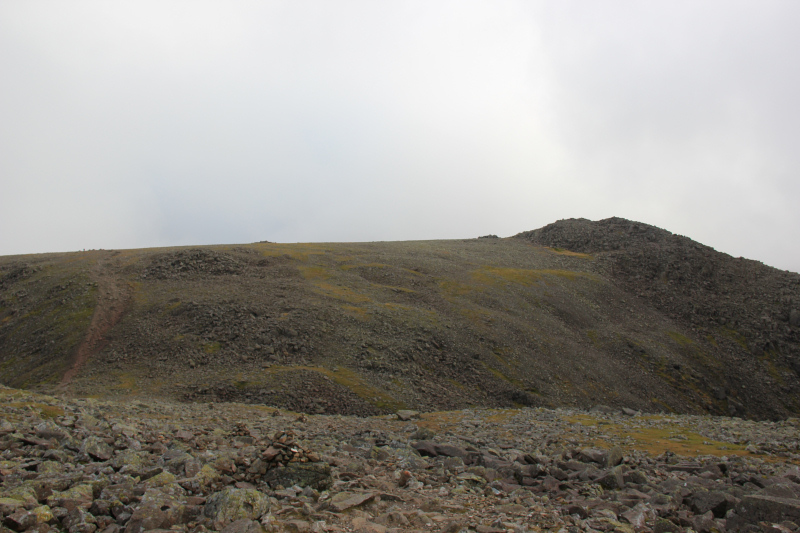 I decided to ascend the left scree slope, which looked the least unpleasant. 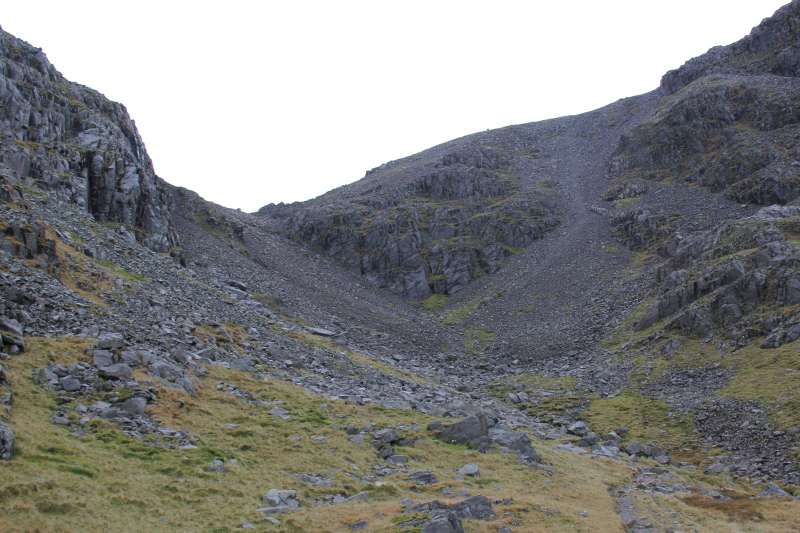 The ascent of the scree slope was quite straight-forward. 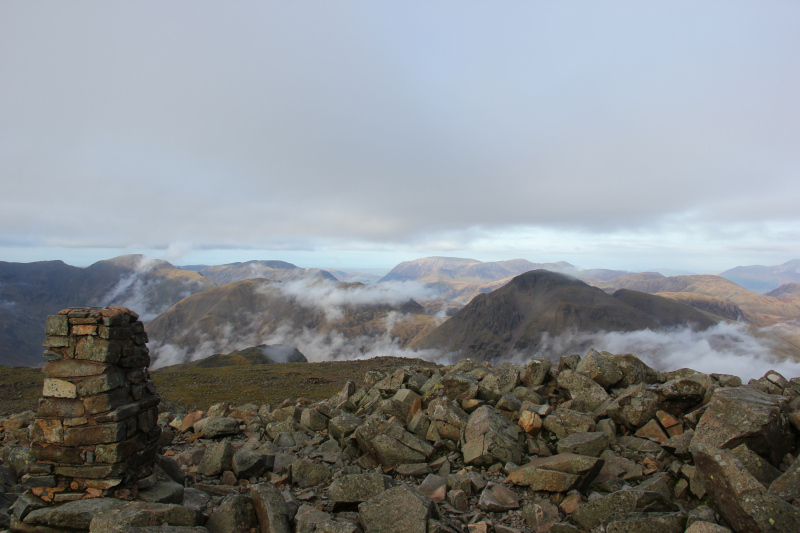 On reaching the top of the scree slope and gaining the final ridge to Scafell Pike, I was well-chuffed with the views. “FOG” all day my ar*e! 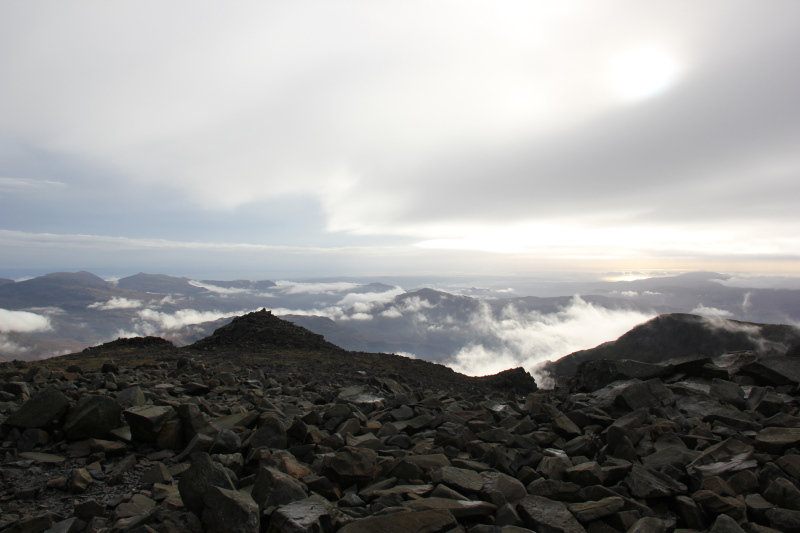 The final ascent towards Scafell Pike didn’t take long. 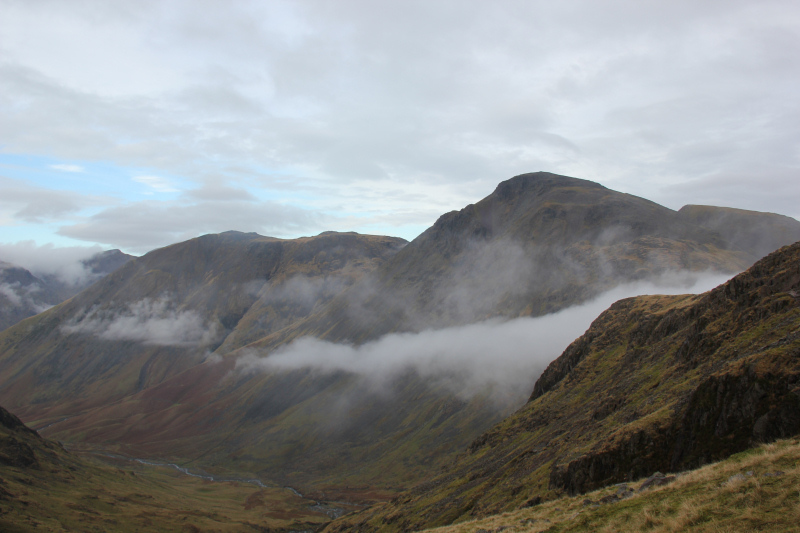 During the ascent it was good to be able to look across to see Broad Crag and Ill Crag, my other two objectives of the day. 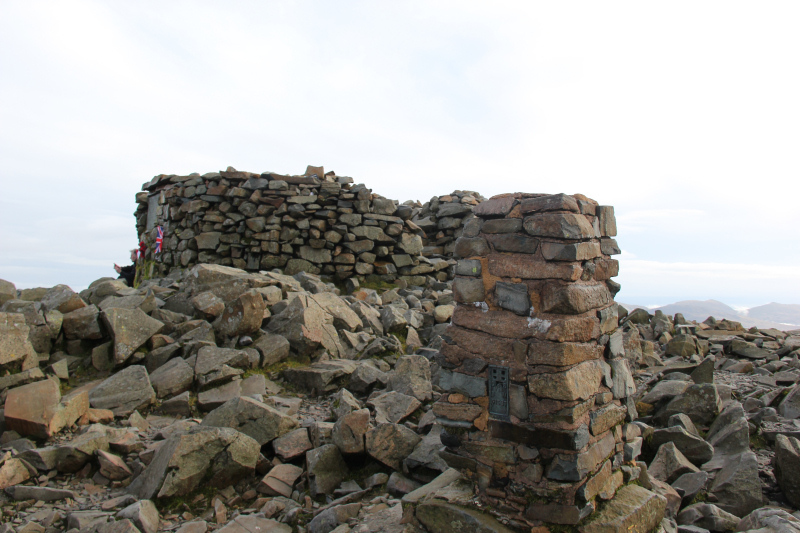 I didn’t spend long at the summit as I was very conscious of time. It was already almost one hour later than the time I had hoped to reach the summit. 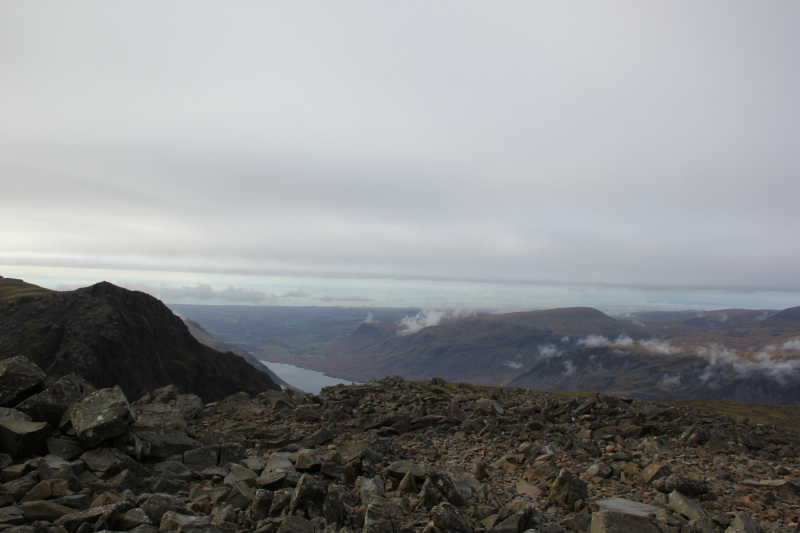 During the descent from Scafell Pike towards Broad Crag, I passed a young couple. The girl was descending like a crab, scared to walk from boulder to boulder. I hope they had headtorches. 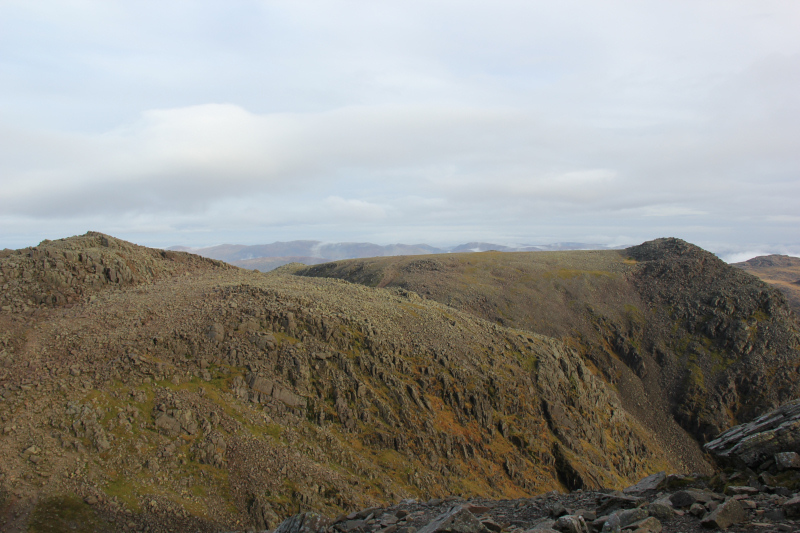 I found the ascent of Broad Crag to be a bit unpleasant. Lots of boulders to clamber up. 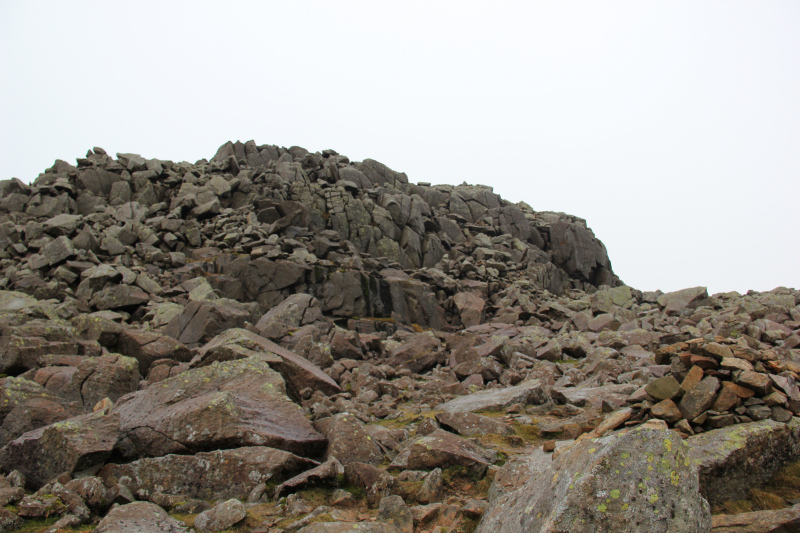 It reminded me a bit of Glyder Fawr in Snowdonia but on a much smaller and less impressive scale. 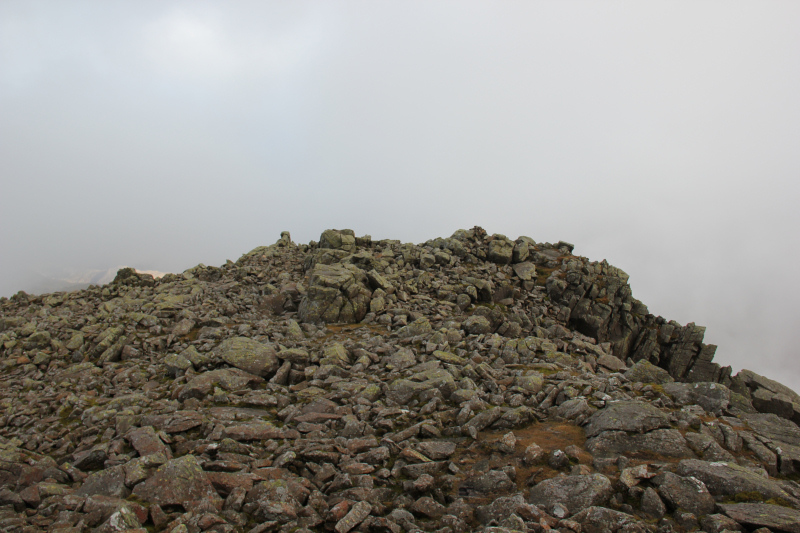 After summiting Broad Crag, I made my way across to Ill Crag, which is another summit of boulders. 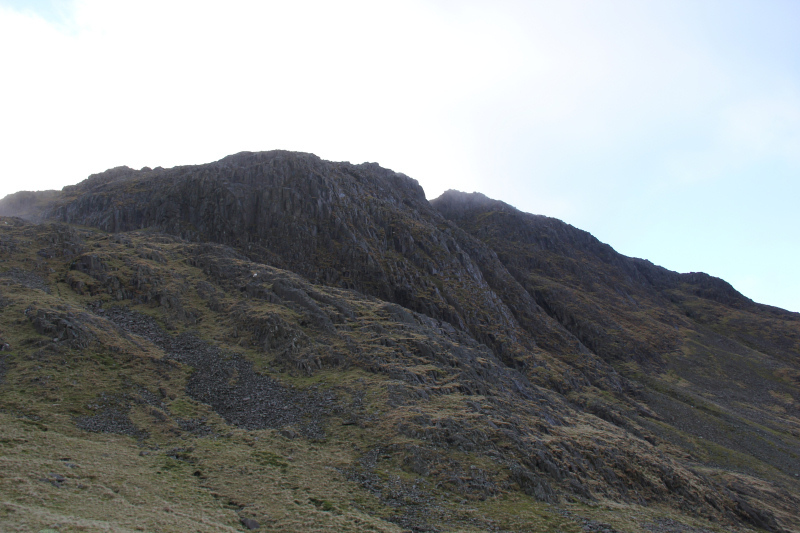 Thankfully its ascent was much easier than that of Broad Crag. 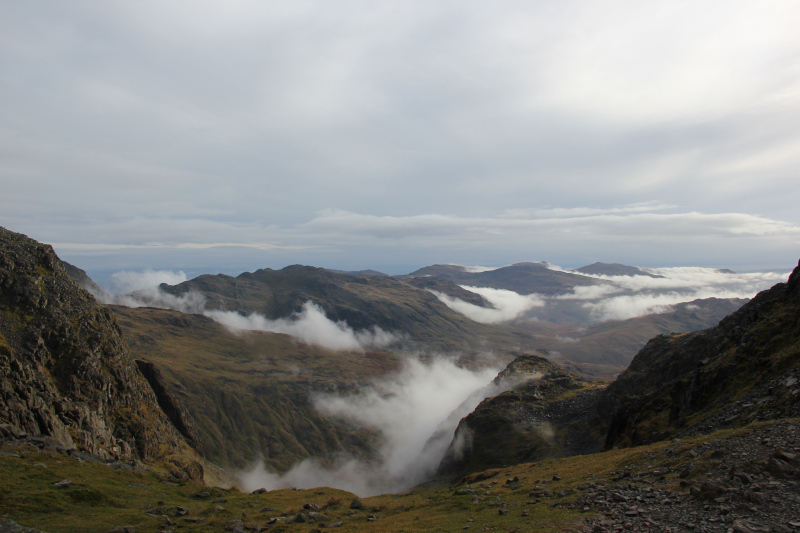 At the top of Ill Crag, I realised that I had two hours of daylight left to get back out to Seathwaite. 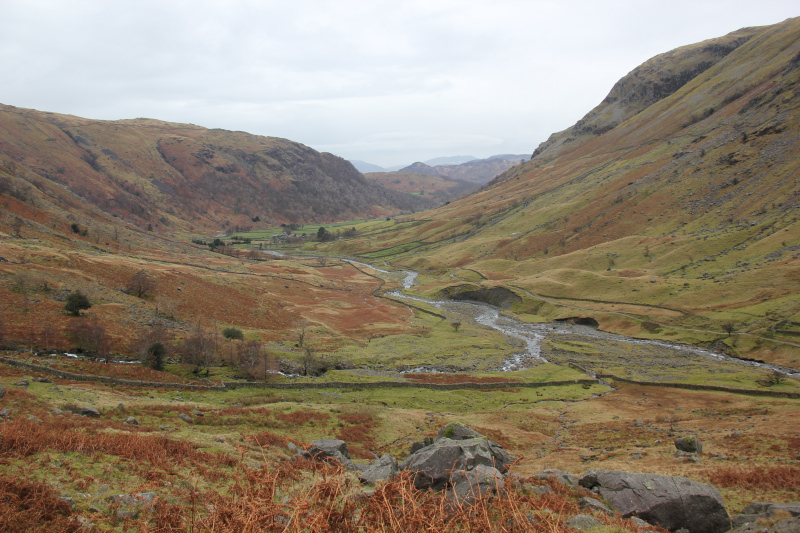 The descent back to Seathwaite took around 2Hrs 15Mins, so it all worked out fine. I had my headtorch with me anyway. 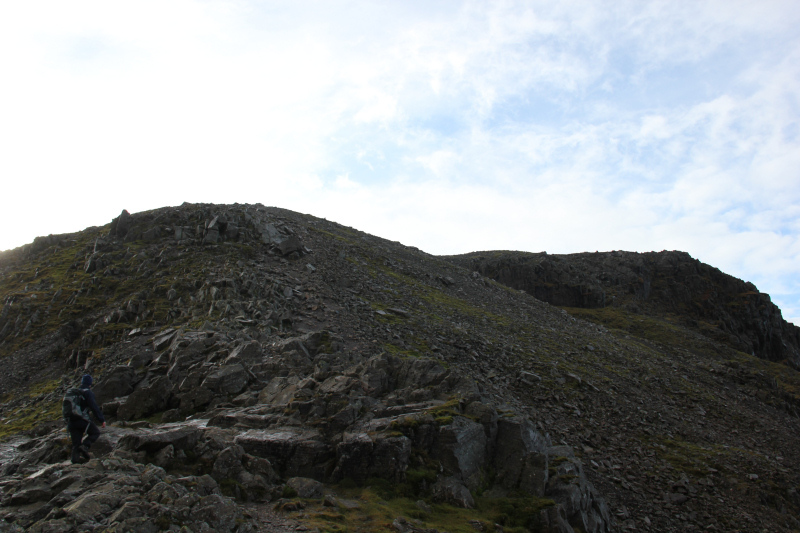 There was a bit more boulder-hopping to do as I skirted around Great End. 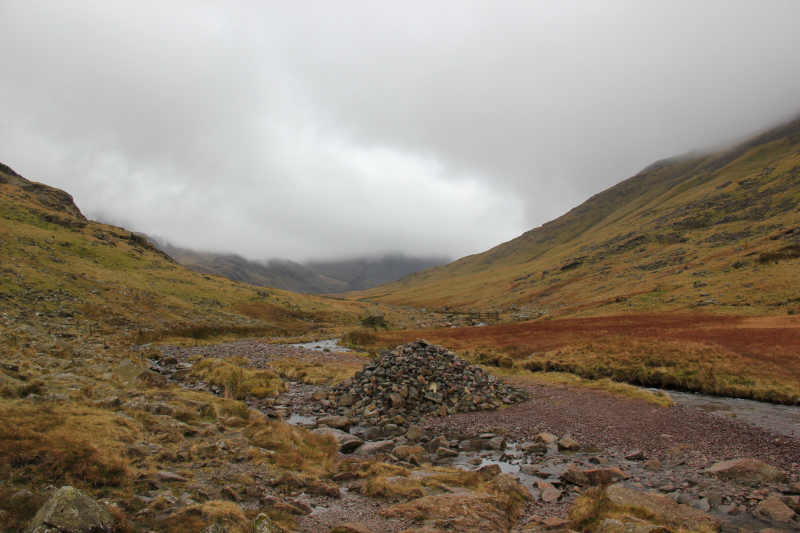 On reaching Esk Hause, I decided to confirm my location by again using Viewranger to confirm I was on the correct descent path. 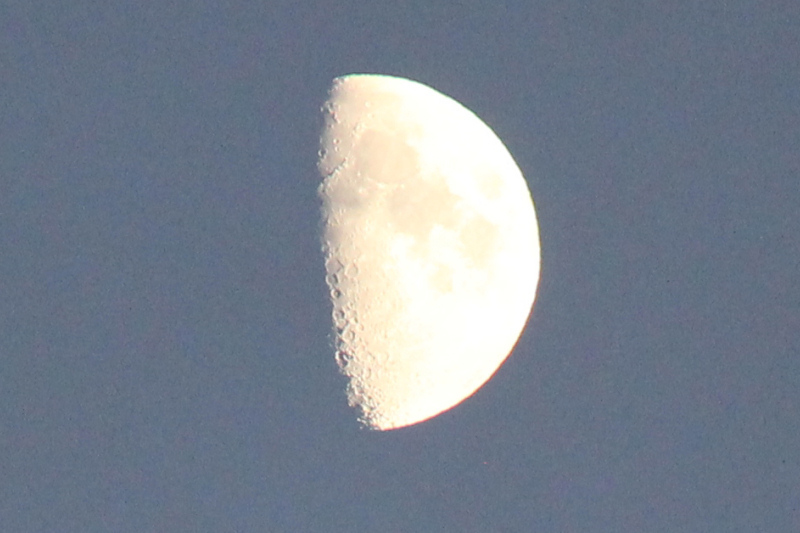 With little daylight to spare, I didn’t want to find myself on the wrong track. 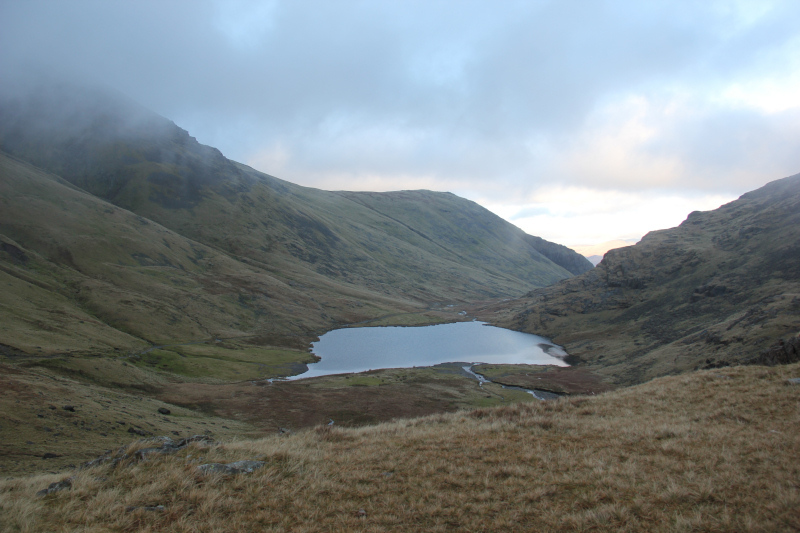 During the descent, I was quite impressed with Sprinkling Tarn. 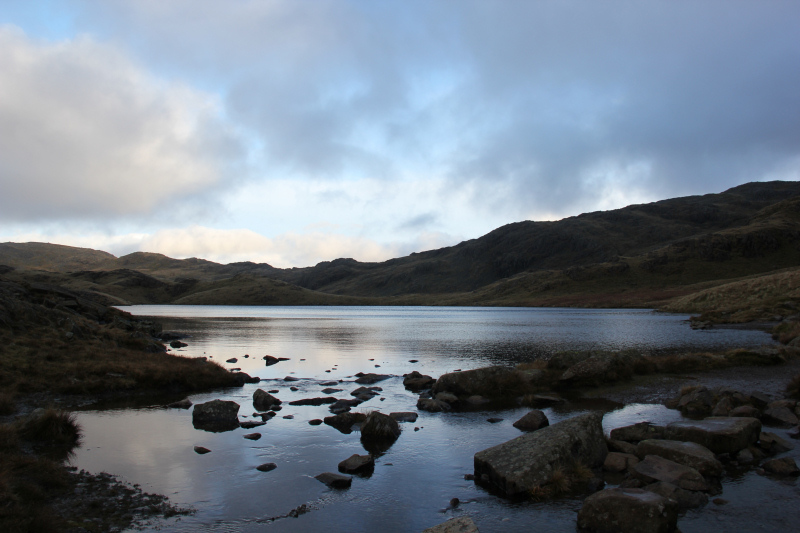 Beside the tarn, I met a group who would appear to have been receiving navigation training. 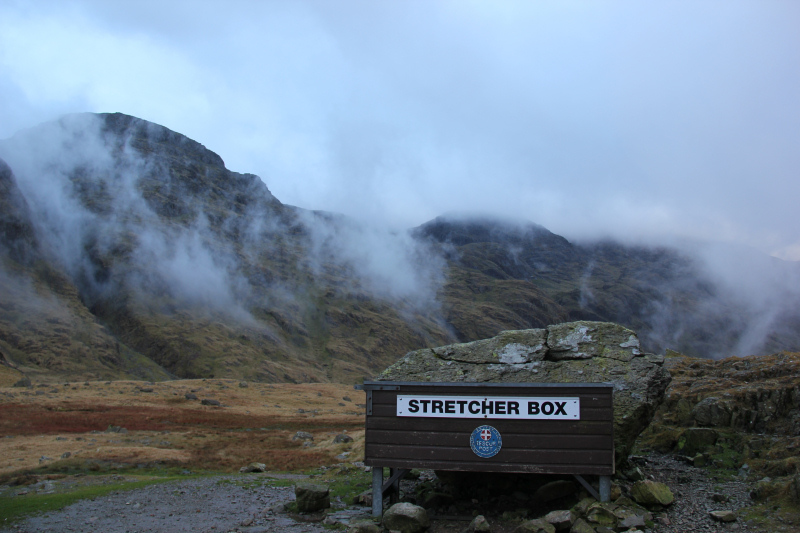 I was a bit relieved to reach the Mountain Rescue box, as I knew what lay beyond. 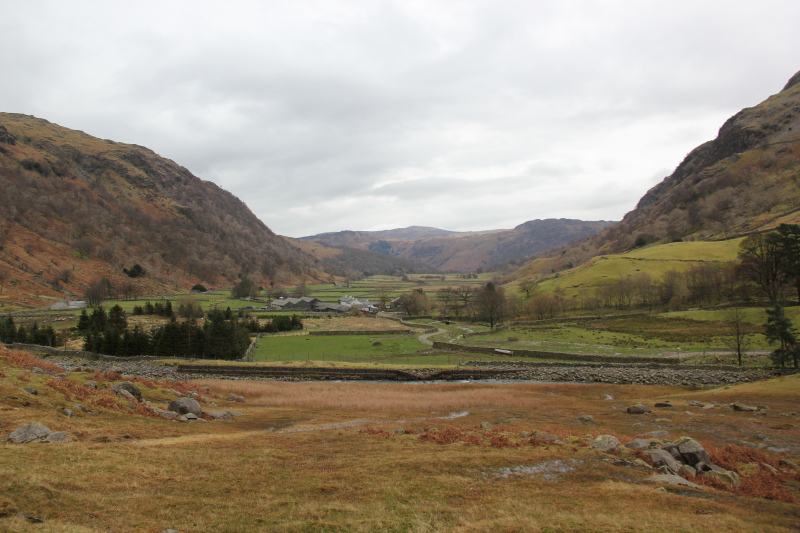 From there, it was simply a case of returning via my in-bound route as far as Stockley Bridge and then taking the main track back to Seathwaite. 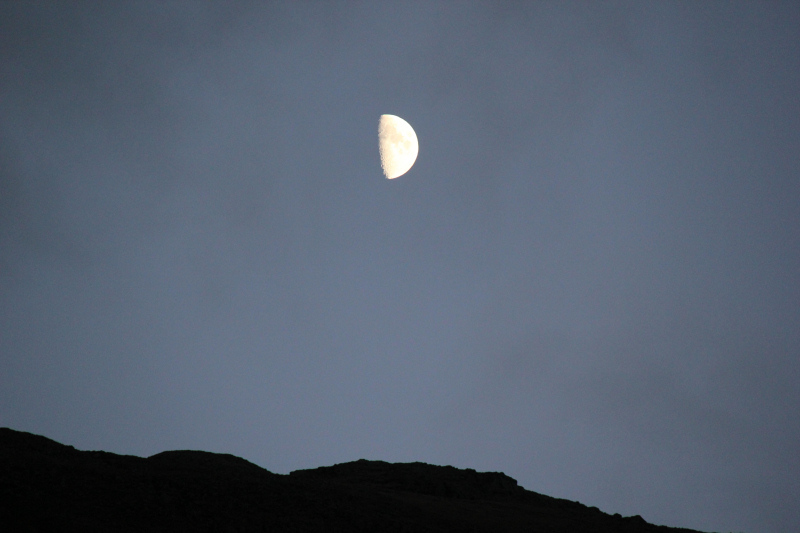 It was nice to see the moon rising over the crags as I made my way back. 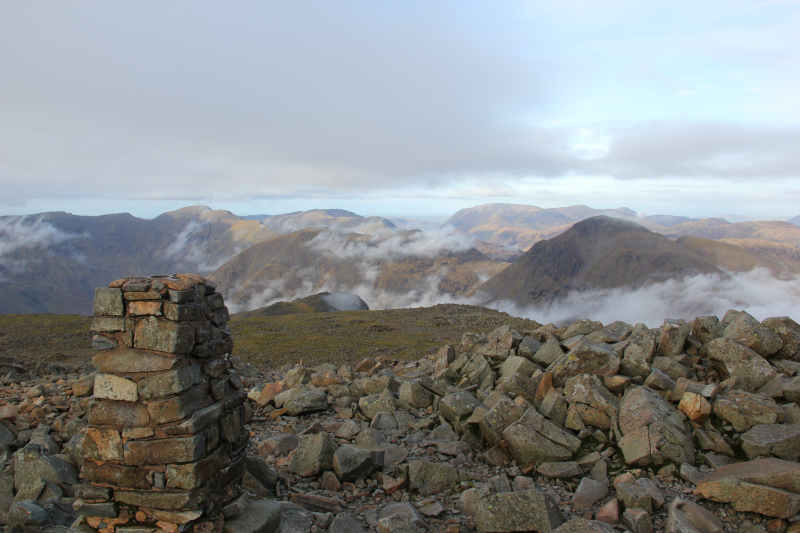 This is a really good route up Scafell Pike. I would definitely recommend it .